Get Squashed! Nutritious Fruit (yes, fruit)! Contrary to popular belief – and grocery store shelving – squash is NOT a veggie. Any student of botany will tell you that a plant whose seeds are contained within the edible section is a fruit. This delicious fruit is thought to originate in Mexico and Central America, along with corn and beans and were staples over 7,000 years ago. The Native Americans grew many types of squash and shared them with European explorers who, in turn, took them back to Europe. Squash and its gourd cousin the pumpkin are grown and eaten all ’round the world today. There are two types of squash, summer and winter. Let’s take a look at each type and how to prepare them. We’ll look at pumpkins (and other gourds) later. Summer squash has a mild and sweet flavor, a tender flesh, and high water content. 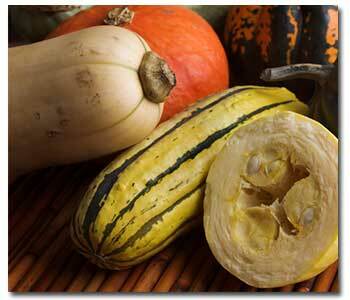 Flavor peaks when the squash are small – around four to six ounces. You can keep them for up to five days in a plastic bag in the refrigerator. You can leave the seeds in or scoop them out, whichever you prefer. Preparation is easy, as summer squash do not need to be peeled before cooking. 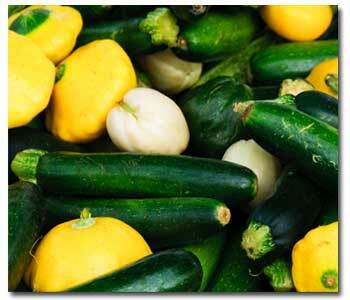 Due to the high water content, you should salt summer squash 15 minutes before cooking. This draws out some of the water, which you can then blot off with a towel. Summer squash are best cooked with dry heat methods such as grilling, sautéing, or stir frying. This keeps them from going mushy. You can also vsteam, bake, deep fry, or simmer summer squash, though. Just as squash is a fruit, not a vegetable, winter squash are actually a warm weather crop. They get their name from the fact that they can be stored through the winter. You’ll find four types of winter squash, the curbita pepo (such as acorn and spaghetti), cucurbita moschata (calabaza and others), cucurbita mixta (butternut and others), and cucurbita maxima (hubbard, turban, banana and others). There are pumpkin varieties in all for types. Unlike their summer cousins, the skin on winter squash is hard and thick, and completely inedible. These delicious fruits must be peeled before cooking or eating; another option is to scoop the cooked flesh out of the peel after cooking. Winter squash flesh is firmer and requires longer cooking than the summer varieties. It can be roasted, braised, microwaves, steamed, boiled, and simmered. You should choose winter squash that are heavy for their size; they can be stored unrefrigerated for up to a month or more in a cool dark place. 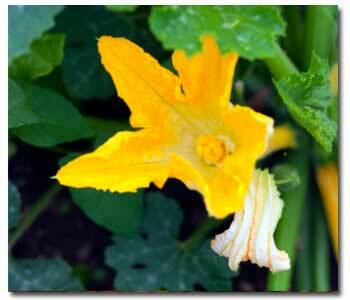 Many people don’t know that the blossoms for both summer and winter squash are edible. You can get them from late spring to early fall at many markets. Look for blossoms with closed buds. They’ll be a bit limp, but don’t worry that’s normal. They must be refrigerated and can be kept for no longer than one day. These beautiful and delicious flowers can be battered and fried, stuffed and baked, or eaten raw as a garnish or in salads. Are you ready for another botany lesson? 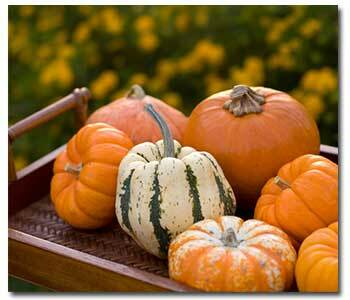 Pumpkins are actually a member of the gourd family, which includes other favorites such as muskmelon and watermelon. Pumpkin flesh is usually orange and is high in vitamin A; it has a mild, sweet flavor. Look for small pumpkins that are heavy for their size and have no soft spots. You can store pumpkins in a cool, dry place for up to a month. You can also refrigerate them for up to three months. Pumpkins can be cooked following the same directions for winter squash. However, pumpkin seeds are a delicious, nutritious snack when properly prepared. They must be husked and roasted and have a nutty flavor. Other than pumpkins, gourds cannot be eaten. But, they do have some great uses. Once dried, they are perfect for decoration. Their extremely hard shell makes them excellent vessels for water, as well as storage containers and musical instruments.